For the Petitioner :- Mr. Manoj Kumar, Advocate. For the Respondent :- Mr. Lekh Raj Sharma , Addl. A.G., Punjab. Satish Kumar Mittal, J. - This is second petition for regular bail filed by petitioner Baldev Singh in case FIR No. 65 dated 4.5.2001 under Sections 302/364/323/148/149 IPC, registered at Police Station, Morinda, District Ropar. His earlier petition was dismissed by this court on August 30, 2004. 2. I have heard counsel for the parties. 3. The petitioner is stated to be in custody since 8.5.2001. On 30.8.2004, when the earlier petition was dismissed by this Court, trial court was directed to expedite the trial. Counsel for the petitioner states that the trial has not concluded so far and out of twenty four prosecution witnesses, only seven witnesses have been examined. 4. Counsel for the petitioner contends that as per the prosecution version, the dispute took place on account of parking of a vehicle. As per the complainant, 3 salangha blows were given by the petitioner on the right flank of Ranjit Singh deceased and his co-accused Talvir Singh is alleged to have given a gandasi blow on the right flank of the deceased. Counsel contends that as per the post-mortem report, only two injuries were found on the right flank of the deceased. He thus submits that the alleged injuries are not corroborated by the medical evidence on record. Counsel further contends that in the alleged occurrence, the petitioner also suffered grievous injury on his body. He has pointed out that co-accused Talvir Singh has already been granted bail by this Court vide order dated July 3, 2004, passed in Crl. Misc. No. 10412-M of 2004. Counsel for the petitioner further contends that PW-7 Mohinder Singh driver, who was present at the time of the alleged occurrence, has not supported the prosecution version. 5. 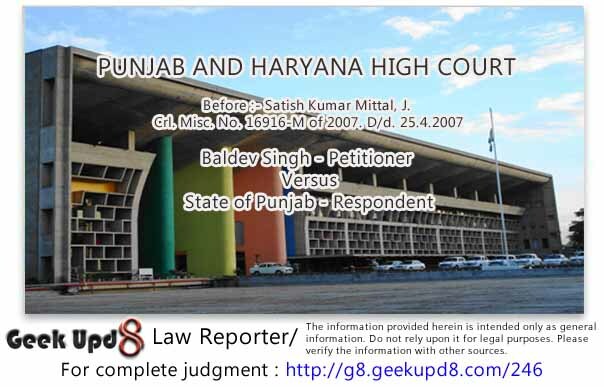 In the facts and circumstances of the case, since the petitioner is in custody since 8.5.2001 and in spite of the direction given by this court, trial has not been expedited, as the prosecution is delaying the matter and keeping in view the right of the accused of speedy trial, I deem it appropriate to grant bail to the petitioner. Bail to the satisfaction of the trial court.